That is really pretty and it fits you perfectly!!! Another winner! The fit looks perfect and I LOVE that fabric! some of my favourite patterns have been from New Look. I think they have a slightly younger feel than the big 4 do. Yes, I've had some bad luck with them but I've had others that I have used over and over again so I always check the new ones out in case there is something I like. Great dress and great fabric! Two winners in a row! Love them both. And the fit is spot on. I am adding both of these patterns to my wish list. I like New Look patterns too. That fabric is to die for... Spotlight never has anything like that when I go in.. The dress looks amazing I love the tie detai. Pretty dress..great fit! I Love your fabic! What a fantastic dress this is...and I love it with the black jacket. You should just make a bunch of both of these patterns with different necklines and fabrics because both of these patterns are winners...and what a wonderful wardrobe of dresses you would own! As for knit dresses, I line most of mine and I use a tricot lining purchased from fabric.com. I like to have something between me and the knit fabric. I missed your purple dress post somehow, so you'll get a two for one compliment with my comment! Both dresses look great - they're incredibly flattering on you. I'm drooling over that purple fabric & the Rorchach dress looks stunning, too. I heart New Look. As one who grew up having to guess what size I was, and buy that single size pattern, the revolution of multi-size patterns in the late 1970s-early 80s was a-m-a-z-i-n-g. New Look offers a range of basics unavailable at the Big 4; and some interesting details that are far more affordable in New Look than in most Big 4 price ranges. Wow! That dress is perfection - the mix of pattern, fabric and fit is exceptional. I have that pattern too! Thank you for making it up for me. `-) I am pleased to hear this one fits, too. I will give New Look another try. Love it!! It is a bit Rorschach-y, in a fun way. I find New Looks to be very erratic with sizing, although generally the printed measurements on the pattern are helpful. It's interesting, since I think Simplicity, while still having some excess ease, is at least fairly consistent that way. new Look, even though they are often even the same style as their Simplicity cousins, are all over the map. This dress fits you so beautifully! The fabric is a perfect choice. I can see your using this one as a TNT. Brava! fit is great on you. I love New Look patterns, have made so many of them. Super cute! The fabric is interesting and adds a little spice to a simple style. 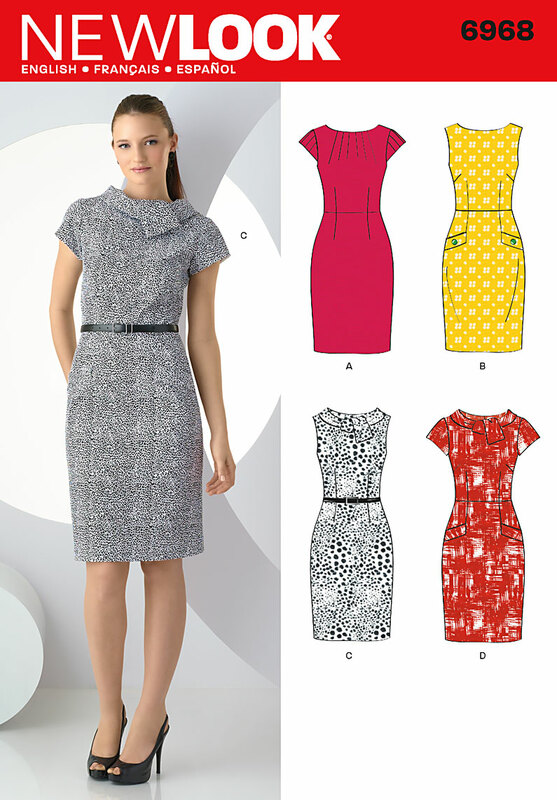 I have alway liked New Look patterns and they have the added advantage of being low priced in the states. You are acheiving fantiastic fit from this brand of patterns. Both dresses look fantastic. Love the ink blot fabric. Oh, I love this fabric. I really love it! The dress is perfect and should fit me exactly. Absolutely beautiful and I love the collar. Thanks for answering my question regarding the overlocker too! That's a pretty dress. Your body is made for this pattern line. Very nice. I would fight you for that dress. Like, throw down battle. It's AWESOME. That print is a-mazing. I think you are the person online whose style I most admire (want to copy). That's perfect. Your fabric choice is fantastic! I have this pattern in queue but don't think I will find a fabric a nice as yours to do it justice...Dang! Anyhow, you did a fabulous job on the dress! Love your blog. That dress looks very Cue-like (I love Cue dresses). Yours is better though because it fits you perfectly and I bet it only cost a fraction of the price. You convinced me: I should have a new look at New Look. Your dress is adorable. I love the fit and the fabric is gorgeous. Wow, what a great dress! Super lovely! I saw that fabric and liked it but couldn't see me in pink.. but you? Perfect!! BEAUTIFUL DRESS! How fabulous. Lovely style and I'm gobsmacked that you found that remarkably wondrous fabric at Spotlight - really Spotlight??? I had struck it off my fabric shopping haunts but think I need to go for a visit. Your version looks lovely. I really like the fabric you chose. It's funny because I am sure if I saw it in the shop I would have not chosen it, but seeing the finished dress I adore it. BTW...I read a post today about how stylish Kate Middleton is, etc. I am not into royals that much...and I believe your style is way better! Wow, another fantastic dress. The print is so unique and the fit is dead on. I really like this one! Oooh I own this dress pattern too. I will have to make this up before the summer is out!! The collar is SO cute! I'm lov'in this material and the dress turned out so beautiful! Great job! this is just how I am! I can just imagine what a dr. would say! Great dress though... love, love, love the material! And it's perfect for you! Very nice indeed!!! Really great fabric! Great dress, the fit and fabric are perfect. Spotlight does have rare gems you just have to be lucky that it is at eye level. Best dress yet! Spotlight has some fabulous fabrics but it takes work to find them among the tacky, the cheap and the ugly. I love your fabric! Very new wave. Very nice this fabric. I like the pattern.